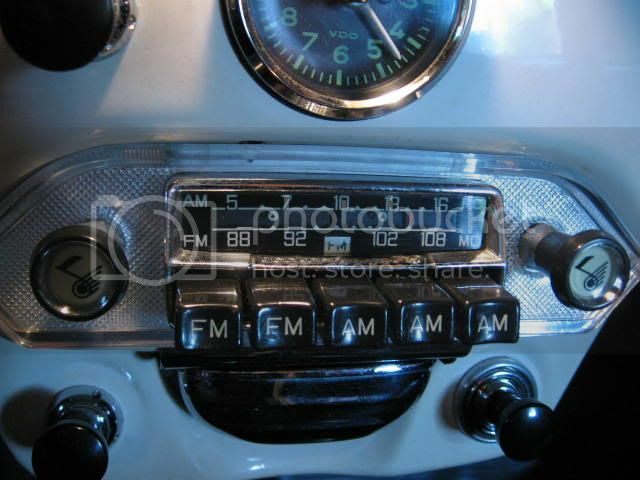 (1) anyone have pictures of the Trim Plate that would have come installed with a Becker Europa radio? Is the plate supposed to be Translucent? Plastic? or Other? No faceplate? (2) Does anyone have a Becker Europa AM/FM (M/U) or M/L/U Radio for sale? On my factory-installed Becker Grand Prix, there is a trim plate like the second one shown in the below picture. It appears as a chrome-like spray to the back of the plate. Original factory installation in my '59 cab. As stated in the article on Becker radios I wrote for the magazine several years back, the A cars came with grey or beige face plates with the waffle pattern. The B and C cars seem to have been fitted with the waffle pattern plates with the chrome like backing. The coarse plate shown is a reproduction. Joris, do you know where you can get Grey or Beige faceplate (original or reproduction)? Scroll down you'll find it. You can always paint it with the rattle can beige available from NLA. The one from Koenigs Klassik is close, but lacks the checkered texture of the originals. Yes, I ordered from those guys before, they also have a "Becker"-plate as well... i think i will go along with your idea of getting the clear plastic one and painting it, unless i can find an original plate. I have a photo above of an original plate, but it comes with an NOS Radio. Unfortunately that radio is AM only. I was wondering if i was to install it with no plate, what would i use to cover up the hole in the knob area? Ben wouldn't the bezels that hold the radio to the dash be sufficient to cover the holes. max handley wrote: Ben wouldn't the bezels that hold the radio to the dash be sufficient to cover the holes. i thought it would, but it does not, or maybe it was not installed correctly, i will double-check, thanks! What color should it be painted? Thanks! Mine which I assume is original is painted on the front side. 1959. Back side no paint.,bottom edge clear,void of paint. Color tan same as steering column, and horn , steering wheel .